NOTE: Urban Patterns will focus on more obscure and/or extreme locations in a number of posts over the next few weeks. According to the Mac version of Google Earth, the center of our terrestrial universe can be found in the City of Chanute of Neosho County, Kansas. When you open Google Earth on a Mac, allow the globe to stop spinning, then only zoom in on the Earth and you’ll eventually find yourself in Chanute, Kansas. 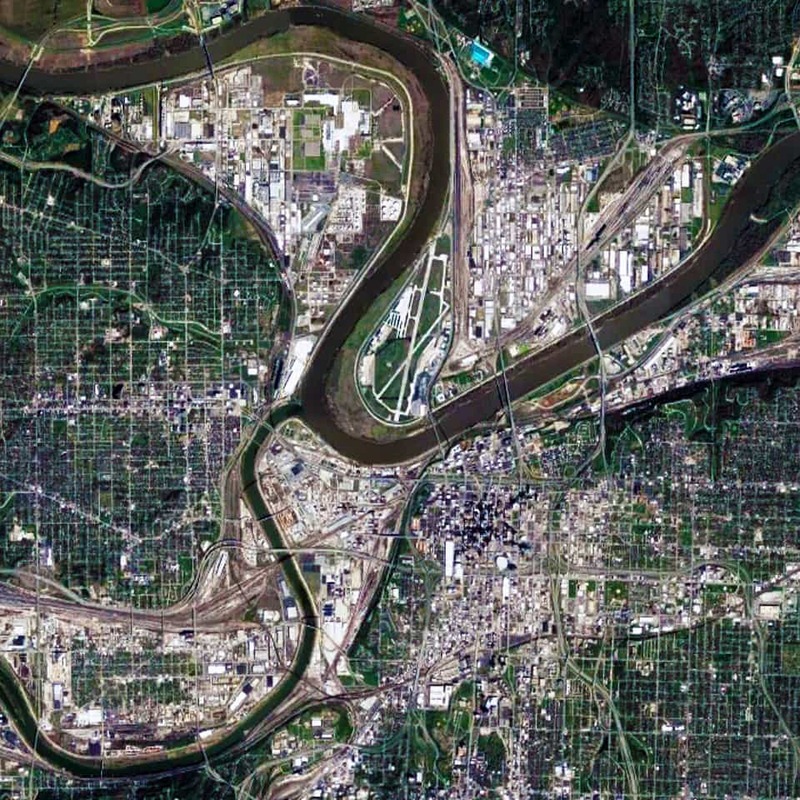 Dan Webb, a software engineer for the Mac OS X version of Google Earth, programed the software this way; he explains his charmingly flippant reasons here. Incidentally, if you do the same on the Windows version of Google Earth (you know, fifteen minutes after the PC has started up and Windows has downloaded all of its updates), you’ll actually end up in Lawrence, Kansas. However, since Apple is infinitely superior to Windows, then the Mac version of Google Earth must be correct about our ‘terrestrial center’. 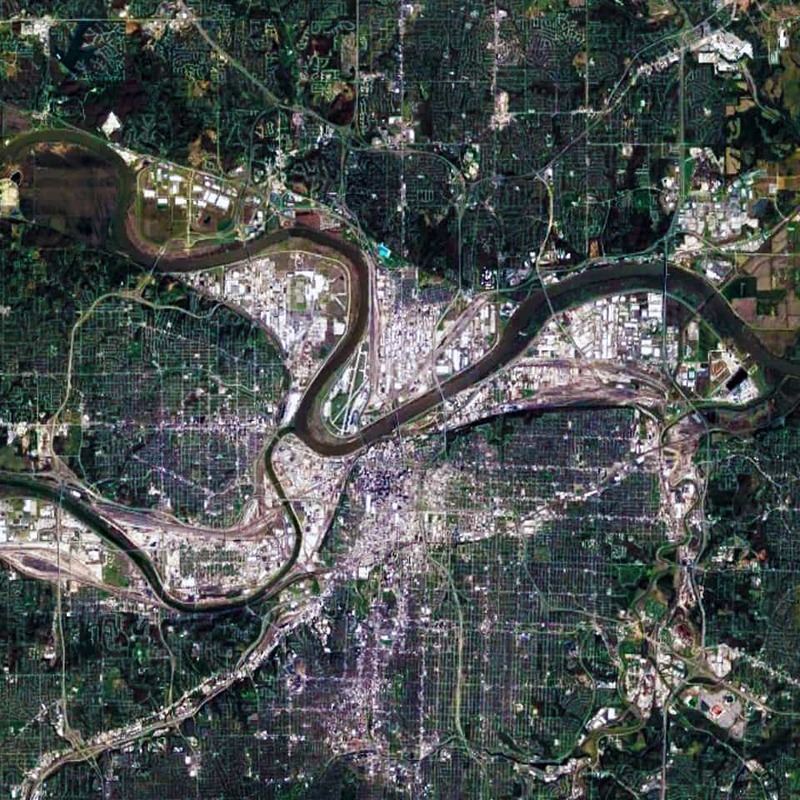 Satellite view from 5 km of Chanute, Kansas USA (Source: Google Earth). “Neosho” is a Native American word generally accepted to be of Osage derivation. It is translated variously as “water that has been made muddy”, “clear cold water” or “clear water”, the last being the most accepted. Chanute was formally founded in 1873. 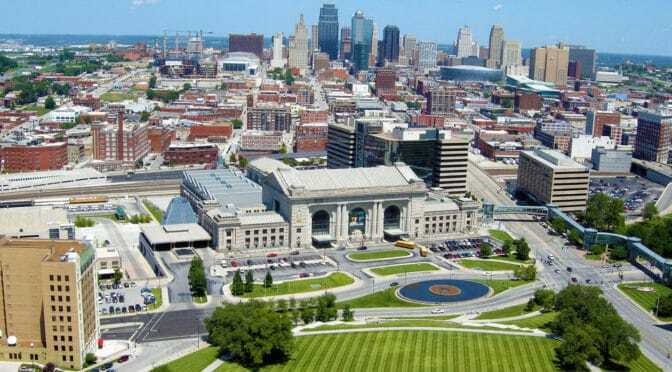 When the Leavenworth, Lawrence & Galveston Rail Road crossed the Missouri, Kansas and Texas state limits within Neosho County, four rival towns initially sprang up in the vicinity of the junction: New Chicago, Chicago Junction, Alliance, and Tioga. The four towns were consolidated in 1872 and the new town was named Chanute in honor of Octave Chanute, a railroad civil engineer. 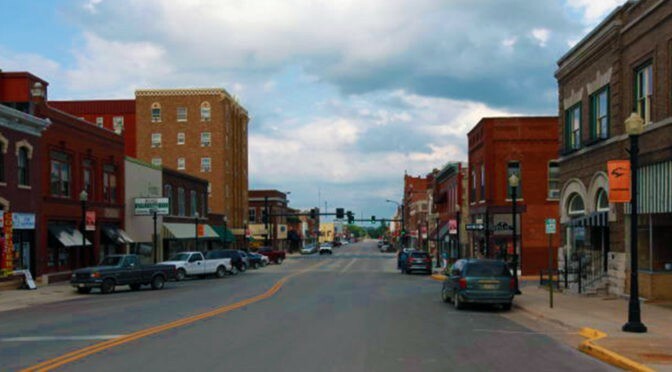 Chanute has a population of approximately 9,100 people (Source: Wikipedia). The urban pattern of Chanute is characterized by several typical – but still interesting – components of the American landscape. First, there is a predominant regular grid aligned to the cardinal directions, consistent with the method of land division established by the 1785 Land Ordinance in the United States; Second, this regular grid marginally shifts from perfect orthogonality. For example, West Main Street (the primary east-west route toward the top of the above image) marginally shifts northward along some distance before shifting southward again into alignment with East Main Street on the other side of the railroad tracks. Third, this regular grid has evolved over time around the railroad line passing through the center of Chanute in a southwest to northeast direction (from Tulsa, Oklahoma to Kansas City, Missouri). This generates a significant interruption to the orthogonal grid in the town, introducing differentiation from east-to-west by privileging those routes crossing the tracks to link both sides of town. Indeed, the interruptions (e.g. the railroad tracks, the large block to the south defining the Neosho Community College campus, and 215th Road/E. 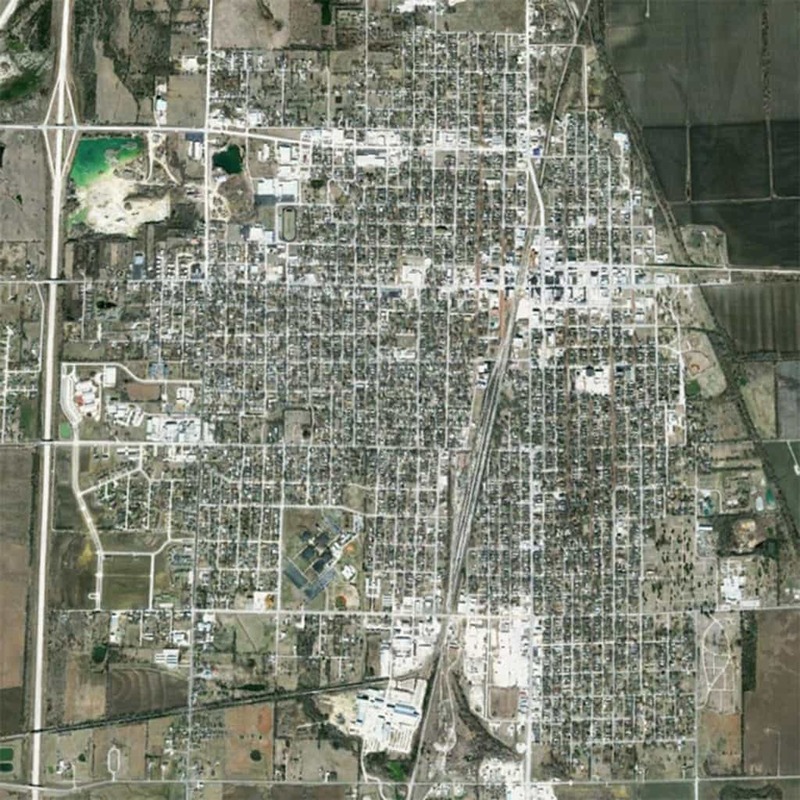 Elm Street angling into the regular grid from the east at the upper middle right of the above image) to the regular grid of Chanute characterize the town as much as the regular grid itself. Finally, the western edge of Chanute is defined by State Highway 169, which mirrors the Tulsa-to-Kansas City alignment of the railroad. However, this is not an interstate highway. Chanute is almost exactly at the center of a ring of interstates, more than a hundred miles in any direction to 35/335 to the north and west, 498 to the east, and 44 to the south. Because of this, and the fact that its population has remained relatively stable over the last 100 years (only variation of +/- 1,000), Chanute has maintained its small-town persona as an American farming community.